A very good friend of mine graduated from the Savannah College of Art and Design so when I saw an innovative new art wall was created for the school I was interested in learning more. Since I also have a thing for Sharpie markers which are being used in this plan it further piqued my design geek’s interest. 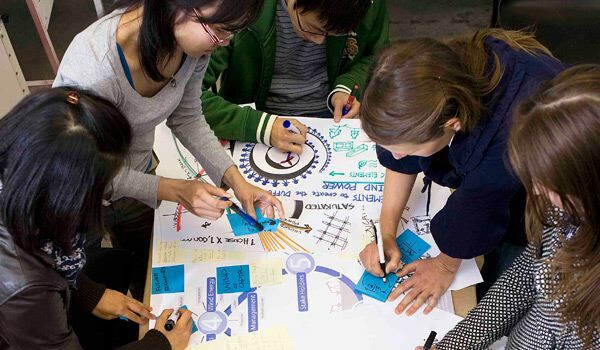 At the University of Delaware we’re thinking about revamping one of the “commons” areas on campus to make the environment more social, comfortable and productive for our students. Looking at other campus we’re seeing a lot of rooms being painted with material that allows for people to draw on them. Savannah College of Art and Design has partnered with Newell Rubbermaid to help the company permanently capture the essence of its brands and celebrate the company’s new Sharpie® brand headquarters and consumer marketing hub in Atlanta. 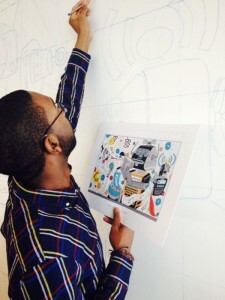 On Feb. 21, 10 SCAD students armed solely with Sharpie permanent markers — from original Fine Point to Neon and Metallics — directed and collaborated with Newell Rubbermaid marketers to turn student designs into wall murals. The spirit of the company’s consumer brands, including Sharpie, Paper Mate®, Calphalon®, Graco®, Goody®, Dymo® and Levolor®, will be captured in Sharpie ink on walls as large as 9 feet by 14 feet. Visit their official blog or scad.edu. 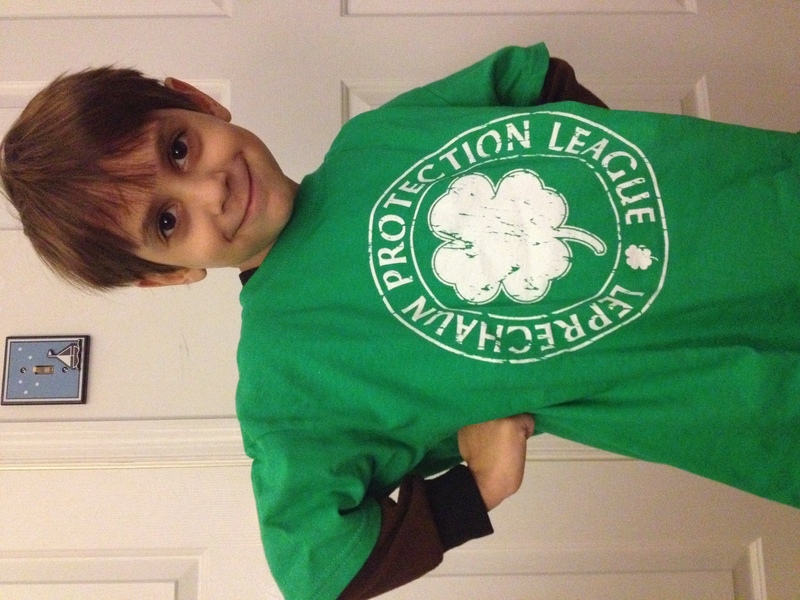 I know it’s not even March yet and Valentine’s Day is this week but you have to have time to get ready for St. Patrick’s Day in advance so that you can look as cool as my Finnegan does in his Leprechaun Protect shirt which he loves. He was rockin’ it last night over top of his footie pajammies. 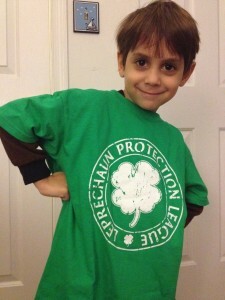 So if you go to SaintPatrickDayShirts.com and look around, browse their collection of green funny t-shirts and then buy one now you won’t have to think about it the day before you go out on your bar crawl because you’ll already have the perfect one. No one will be able to pinch you for not wearing green and everyone will want to know where you got your rad shirt. Now it goes without saying that you probably won’t look as hip and adorable as Finnegan, but you know he’s four and so it’s really hard to out do him. They have t-shirt, hoodies, decals, everything you’ll need for St. Patrick’s Day and they come in all sizes from adult to baby for both the guys and the gals. 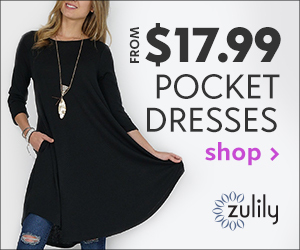 So get browsing and pick something out now. 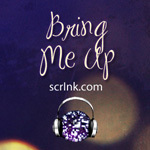 Sssshh don’t tell my husband I’m looking at bling on WhiteFlash.com. They were, after all, named “Lord of the Online Rings” haha. It’s not my fault that I’m a girl and diamonds are a girl’s best friend, right? I mean aren’t we all a little bit distracted by shiny things. We will have been married 6 years this November and I still look at my engagement ring every sing day, I kid you not, I look at it shiny and wave my hand around to catch the sunlight when I’m waiting in the car at a red light. I really don’t think it will ever get old. My husband’s cousin just got married this weekend and so I know his new bride will be having the same attention span issue while she’s admiring her new weddings rings. Her band has diamonds all the way around it, extra sparkle! My engagement ring is perfect. There is no other ring I would ever want and I’m serious about that, it’s the perfect size, quality and it’s so unique. I love when engagement rings can be made to fit the personality of the lady who will end up wearing them forever. Whiteflash.com is one of the companies who can deliver top-knotch quality diamonds, click here to view Tacori engagement rings. The Tacori rings are stunning, you really have to see them in person to appreciate them, but the photos online are also beautiful. The talented Emmy Rossum, star of Beautiful Creatures, has been seen sporting Tacori jewelry. Dexter actress, Julie Benz rocked two Tacori diamond rings at the 2013 Screen Actors Guild Entertainment Weekly Party, sweet! So when, where, and how do you find these rings? The place where you would get the most help and the best team to work with would be at WhiteFlash. They are open to the public for showroom viewings in Sugarland, Texas, but they also have an exquisite online showroom which includes the Tacori, but also the elegant, intricate Verragio rings which are simply gorgeous! See I’m not the type of girl who would want to design my own ring, but I did go with my husband to look at rings. There are so many things to think about and so many options to choose from that you really can’t even grasp. I remember having to sit down with someone while they talked about clarity and metal types. I think if I had to design a ring right now it would be a bead set ring, they have such intricate details in how the stones are laid out, but they are also a simple band without anything rising above the ring or on the edges of the ring so it wouldn’t outshine my beautiful engagement ring. My goal would be for it to ultimately end up being an extra band that I would wear below my wedding band I suppose, so more like an anniversary band. What is the playable Google Doodle about today? The delicate music and the strolling scene of today’s Google Doodle has me a bit mesmerized. 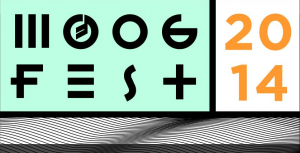 The music does have an artist and a title and it the artist which has inspired Google today. Achille-Claude Debussy‘s “Clair De Lune” translated of course means “light of the moon” hence the fitting interactive doodle. In other news, there is a red aura or halo around the sun, or at least there was this morning. I don’t think that bodes well. I’m not sure what it means thought. Anyone? Beuler? I downloaded a new app on my phone called GrooveBook and I’m very excited to give it a try when Braeden and I attend the Kids’ State Dinner at the White House in a couple of weeks. 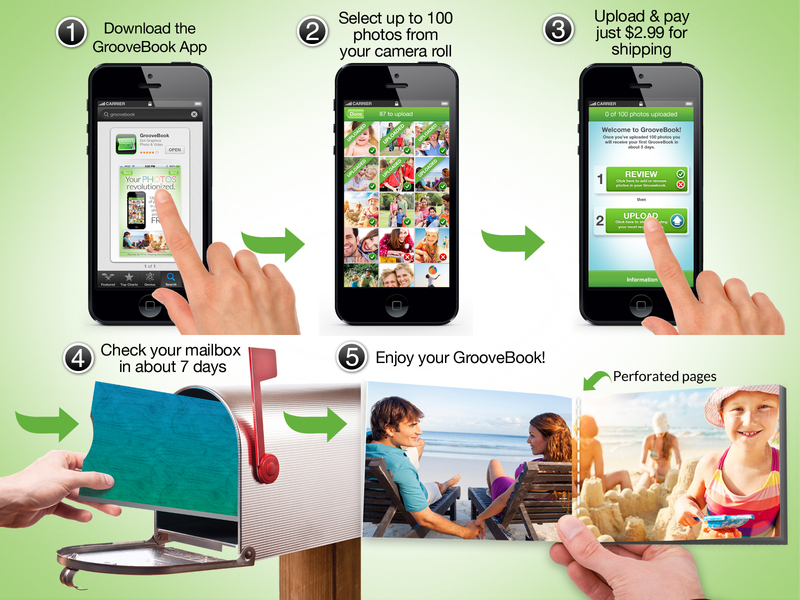 You can upload 100 of your favorite photos from your phone, send them to GrooveBook, pay $2.99 shipping and they will send you a photo book with those photos. The date and location is printed on the back of the photos and they are perforated for easy sharing. You could choose 5 of the same photo to be placed in the book and then when you are bragging about the photos, rip one out and share it with a friend or family member. I mean how cool is that idea? 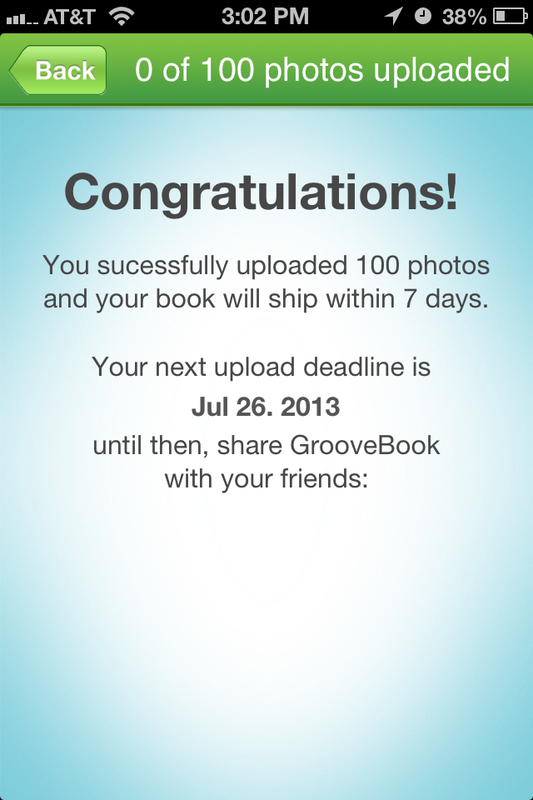 I know my Mom would love to have a GrooveBook in her purse to take to Church and share with friends. I’m going to need to have a few of these things printed me thinks. I’m going to go ahead and give it a try before we head to DC just to see how it turns out. I downloaded the app and signed up within three minutes, it’s so easy to do. You have to type in a code at the end and we have one just for our readers. 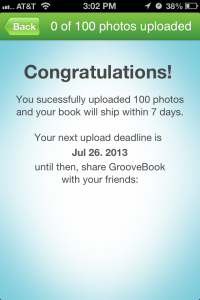 After I signed up I picked 100 photos from my phone to upload and have made into a book. The process was easy, a green check mark appears when you have selected a photo for upload. Then it goes through and adds them to a book. Now my phone is on a wireless network right now and it did take about five minutes so I would say you should probably do this where you have WiFi and not over the normal data 4G. Be sure to check back here after our visit in Washington, DC to see what our GrooveBook looks! 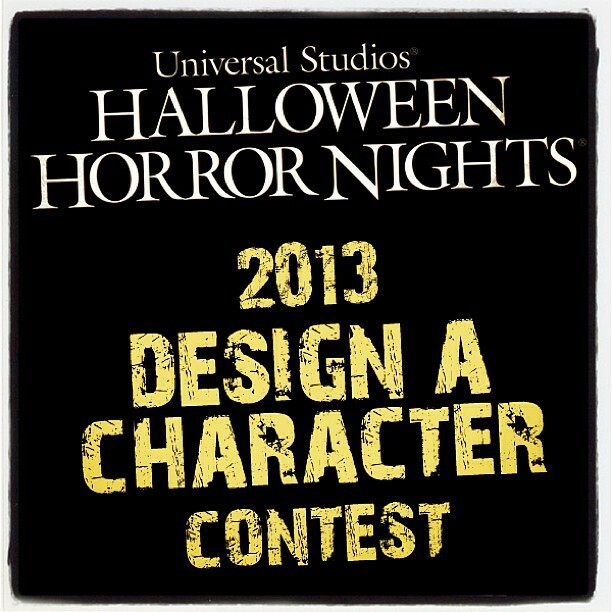 Universal Studios’ Halloween Horror Nights 2013 “Design a Character” Contest. Universal is giving everyone a chance to design and re-invent their own Universal Classic Monster and have it brought to life this year at HHN! Enter a detailed drawing or written description of your character design based one of the iconic monsters on their list (including Dracula, Werewolf, Mummy, etc.). The winner and a guest will be invited to attend their design unveiling at the red carpet opening night in Hollywood. 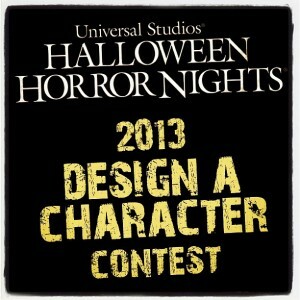 For those of you out there who ARE into Horror Nights and designing then get busy! All entries must be submitted by July 1st. Then, you can vote on the finalists featured on the Halloween Horror Nights Facebook page on July 2nd. Full contest rules and guidelines can be downloaded here.